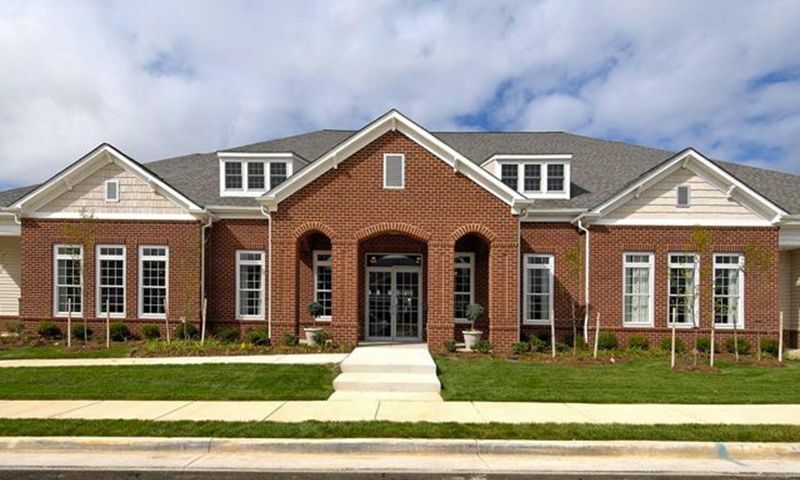 Spring Hill is a gated 55+ community in Lorton, Virginia. This active adult community enjoys a convenient location near I-95 making it an ideal location for working active adults and retirees who want to live near their families as well. Residents often take advantage of the many local restaurants and recreational opportunities nearby. This Del Webb neighborhood offers three different types of home styles: mid-rise condos, attached homes, and single-family homes. Homebuyers can select a resale home that meets their unique needs. With top-notch amenities and like-minded neighbors, Spring Hill is the perfect place to meet new friends and enjoy your favorite hobbies. Spring Hill has an exclusive community clubhouse that offers everything residents could need or want to stay healthy and active. Fitness-minded residents can work out with state-of-the-art equipment in the exercise room or swim laps at the indoor pool. There is an inviting great room and ballroom where Spring Hill residents often attend parties and social gatherings. Those with a competitive side enjoy meeting friends in the billiards room and bocce ball court. When grandchildren are visiting, the community gazebo and playground are great outdoor amenities for them to explore. Del Webb began construction of Spring Hill in 2006 and was completed in 2014 with 282 residences. There are condos, attached homes, and single-family homes within Spring Hill. The condos are the newest home styles that feature five floor plans between 890 and 1,621 square feet. The first condo building was built in 2010 and Del Webb has built five 25-unit buildings. Every unit has two bedrooms, two bathrooms, and a one-car garage on the ground level. There are a handful of attached homes that were built in Spring Hill. These residences offer approximately 1,975 to 2,250 square feet of living space. The majority of Spring Hill s attached homes were built in 2006 with two to three bedrooms, two to three bathrooms, and an attached garage. Many of the single-family homes were built between 2006 and 2011 with about 2,300 to 2,500 square feet of living space. Spring Hill's single-family homes are a great option for active adult homebuyers who prefer more space. They were built with two to four bedrooms, two to four bathrooms, and an attached garage. All of the attached and single-family homes in Spring Hill are offered on a resale only basis. Homeowners of Spring Hill pay a reasonable association fee that covers snow removal, landscaping, and upkeep of the amenities and common areas. Residents enjoy a worry-free lifestyle that gives them more time to enjoy all of the activities in Spring Hill. There are a wide variety of clubs and groups that cater to Spring Hill's residents favorite hobbies. Groups like quilters club, knitting, arts and crafts club, scrapbooking, and puzzle club are some popular creative groups. Fitness-minded folks enjoy attending yoga, jazzercise, line dancing, and Tai Chi classes. With a book club, computer classes, potluck dinners, and an array of card games Spring Hill provides many opportunities to make new friends. Spring Hill is located in Lorton, Virginia just 20 miles south of Washington D.C. This Fairfax County community is close to the medical facilities at Potomac Hospital and Inova Alexandria Hospital. Public transportation on the commuter train, bus, or Amtrak is found just two miles away. Spring Hill is also located near many shopping centers including Lorton Marketplace, Gunston Plaza Shopping Center, Potomac Mills, Pentagon City Mall, and Tysons Corner Mall. With Ronald Regan Washington National Airport and Washington Dulles International Airport both about 30 minutes away from Spring Hill, traveling is made easy. Charming downtown areas and cultural attractions surround Spring Hill in cities like Occoquan and Alexandria. Del Webb's Spring Hill was thoughtfully designed in a convenient location with a variety of homestyles perfect for today's active adult. There are plenty of activities available in Spring Hill. Here is a sample of some of the clubs, activities and classes offered here. Homebuyers can select from five condo floor plans that range from 890 to 1,621 square feet. Units offer two bedrooms, two bathrooms, and one-car garage located on the ground level. Del Webb began construction of the first condo building in 2010 there are five buildings within the Spring Hill. There are a handful of attached homes in Spring Hill that are approximately 1,975 to 2,250 square feet. These residences were built with two to three bedrooms, two to three bathrooms, and an attached garage. Spring Hill's attached homes are available on a resale only basis. Please Note: Floor plans are not available at this time. There are many single-family homes that were built in Spring Hill. These detached homes offer approximately 2,300 to 2,500 square feet of living space with two to four bedrooms, two to four bathrooms, and an attached garage. Single-family homes are available on a resale only basis. Please Note: Floor plans are not available at this time. We have lived here for 3 years now and really like it. I especially enjoy all the new friends I've made and the great clubhouse. The community is small and very friendly, even for our grandkids. They like coming to visit to play at the playground and go for walks in the neighborhood. We like being so close to DC and still are able to enjoy all the great perks of living in this beautiful area. 55places.com is not affiliated with the developer(s) or homeowners association of Spring Hill. The information you submit is distributed to a 55places.com Partner Agent, who is a licensed real estate agent. The information regarding Spring Hill has not been verified or approved by the developer or homeowners association. Please verify all information prior to purchasing. 55places.com is not responsible for any errors regarding the information displayed on this website.